LIMA, Peru - Paroled U.S. activist Lori Berenson said Saturday that she and her toddler son were not permitted to leave Peru, despite being granted permission in court to spend the holidays in New York with her family. Berenson did not provide more of an explanation in a brief phone call with The Associated Press. "They didn't let me leave and they're putting out this version that I arrived late," she said. Authorities made no statement on the issue and the AP was seeking comment. Berenson, who was paroled last year after serving 15 years for aiding leftist rebels, was given permission to leave the country beginning Friday with the stipulation that she return by Jan. 11. She had been denied such permission in October, but a three-judge appeals court on Wednesday overturned that lower court judge's ruling, said Guillermo Gonzalez, spokesman for Peru's judicial system. Her father Mark told the AP on Friday that she had every intention of returning to Peru. The terms of her parole dictate that she cannot leave until her sentence as an accomplice to terrorism ends in 2015. "As Lori says, if she doesn't come home, let Interpol arrest her," Mark Berenson said. Peru could seek her extradition and return her to prison if she doesn't return in the allotted time, Gonzalez said. Her father had said Friday that he was "petrified" a negative local reaction to the New York visit could prevent the trip, including celebrating his 70th birthday Dec. 29. "My worry is that there's going to be screaming to stop this," he said. 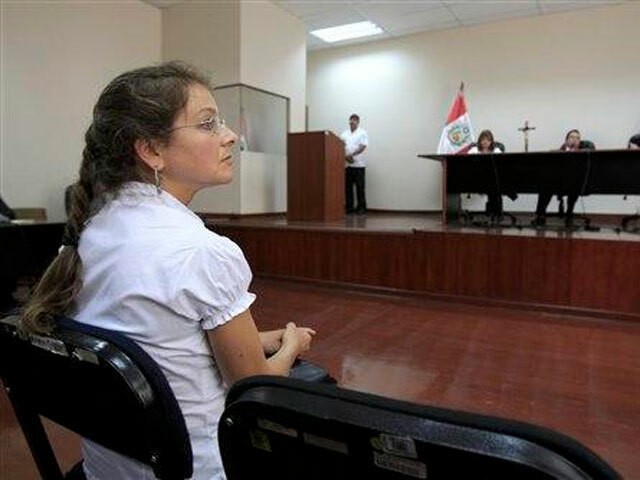 Some Peruvians consider her a terrorist, opposed her parole and have publicly insulted her on the street. A local TV station displayed video on Friday night of Berenson pacing nervously in front of a ticket counter, wearing a bulky black backpack, with Salvador in a stroller beside her. She wore pants and a brown polo shirt. Berenson has been repeatedly hounded and mobbed by Peruvian news media, which has occasionally frightened young Salvador. Last month, one TV channel obtained her new address and showed video of her home. "It was very dangerous," Mark Berenson said. "The (U.S.) Embassy complained." "It's just not fair to Salvador or to her," he said. "They used her like she's a celebrity and she just wants to be a low-profile person and get on with her life and be a good citizen." He said he would appeal to President Ollanta Humala to send his daughter home. Humala could by law commute her sentence but has not indicated whether he might do so. The AP sought presidential palace comment but its calls were not returned. Lori Berenson is separated from Salvador's father, Anibal Apari, whom she met in prison and who serves as her lawyer. Mark Berenson said his daughter is looking forward to seeing relatives she hasn't met since her 20s, including his 96-year-old aunt, and that he wants his grandson, who loves trees, see the New York Botanical Garden's holiday display. Since her initial parole in May 2010, Lori Berenson repeatedly expressed regret for aiding the rebel Tupac Amaru Revolutionary Movement. Arrested in 1995, the former MIT student was accused of helping the rebels plan an armed takeover of Congress, an attack that never happened. Berenson was unrepentant at the time of her arrest, but softened during years of sometimes harsh prison conditions, eventually being praised as a model prisoner. In an interview with the AP last year, Berenson said she was deeply troubled at having become Peru's "face of terrorism."